L'Equipe reports Red Star Belgrade's clash with Paris Saint-Germain was fixed, but the Serbian club have rejected any wrongdoing. 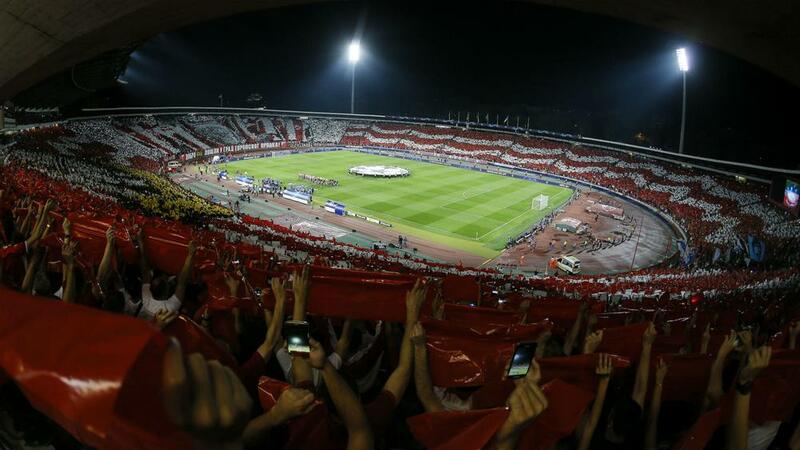 Red Star Belgrade have rejected "with highest anger and abomination" a report the club's Champions League clash with Paris Saint-Germain was fixed. The Serbian champions were beaten 6-1 in Paris on October 3, but L'Equipe claims UEFA has alerted French authorities to an alleged plot by a senior Red Star figure to bet €5million on the club losing by five goals. Red Star have dismissed the allegation absolutely. "Red Star with highest anger and abomination rejects the story L'Equipe published today about a suspicious result of the PSG-Red Star match and the involvement of anyone from our club in possible wrongdoing," the Serbian club's statement read. "The article can harm and bring big damage to our club's reputation and that is why we insist that UEFA and investigators in Serbia and in France investigate the whole story and get the truth. "Today's technologies and other mechanisms are so improved that it is basically impossible to leave this case unsolved. "Red Star expects to get the truth at short notice, to take off any doubt about our involvement in possible wrongdoing." PSG responded to L'Equipe's story by saying: "It was with the greatest stupefaction that Paris Saint-Germain discovered this Friday an article on the L'Equipe website regarding suspicions of match-fixing concerning the Champions League game with Red Star Belgrade on October 3, suspicions regarding the alleged actions of bettors from Serbia. "The club categorically rejects any and all direct and indirect implication in relation to these suspicions and would like to point out at no moment has Paris Saint-Germain been approached by the National Financial Court in charge of the investigation. "Paris Saint-Germain remains at the disposal of the investigators and will not tolerate the slightest attack on its reputation nor that of its officials. To that end, the club reserves the right to take legal action against any party that makes defamatory statements against the club and/or its officials. "The club reaffirms its profound attachment to the fundamental principle of sport, which is and always will be the integrity of its competitions." Neymar netted a hat-trick in the match, which also saw goals from Edinson Cavani, Angel Di Maria and Kylian Mbappe. PSG host Napoli next, while Red Star visit Liverpool.